This is the third in a short series of posts about the early history of the 8000m peaks. In the first post I introduced three memorable characters and in the second I looked at the Sherpa contribution. Today I examine the most famous 8000m peak expedition of all. Maurice Herzog was leader of the French expedition that set out for Nepal in 1950 with the specific aim of making the very first ascent of an 8000m peak. To begin with, they weren’t sure which mountain they were going to climb, as long as it exceeded the magic number. They set off up the Kali Gandaki valley, which these days forms the second half of the Annapurna Circuit trek, with 8167m Dhaulagiri somewhere on the left and 8091m Annapurna on the right. Neither mountain had been mapped in great detail before, never mind reconnoitred for a climb, and the French hoped to do all that and reach the summit of one of them too. With foresight Lachenal had removed his dressings himself and presented his first foot to the executioner ready for sacrifice. At the station before Gorakhpur two toes from his right foot went. The three others would have to be done at Gorakhpur itself. 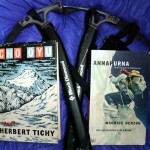 The book has become a classic of mountaineering literature. I don’t know whether the field of amputation has such a rich tradition of writing, but if so then Annapurna is likely to be one of the best amputation books ever written too. 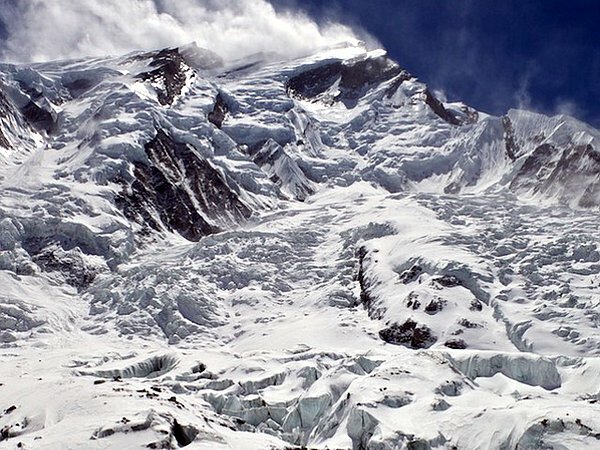 For much of the expedition the team, which included the three experienced Chamonix guides Louis Lachenal, Lionel Terray and Gaston Rebuffat, couldn’t even see Annapurna. They concentrated on exploring the approaches to Dhaulagiri, which rose to the west of the Kali Gandaki in a steep pyramid of ice. 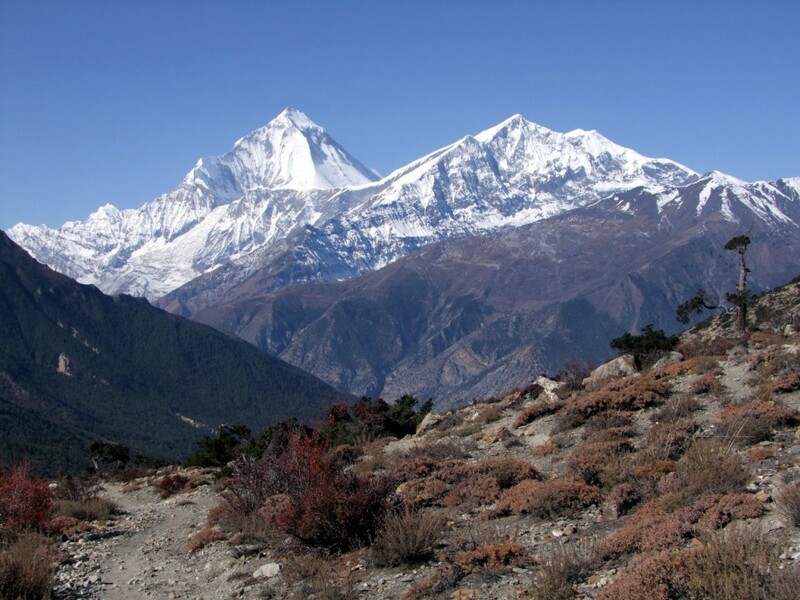 They had their first view of Dhaulagiri on April 17th. Herzog said it rendered them speechless, though he did manage to apply the cliché “out of this world” when he wrote his book. One of the team reconnoitred the South-East Ridge and pronounced it “absolutely frightful”. Terray explored to the north. He looked up at the North Face and said it was unclimbable. 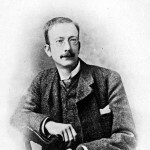 Later he revised his opinion to the much more moderate “fiendishly difficult”. They had been tackling Dhaulagiri for a fortnight and found no reasonable line up the mountain when a monk arrived in the village of Tukuche, where the team had their base camp. It may have come from an unlikely source, but it was sound mountaineering advice. Unfortunately the monk’s prowess in fortune-telling was not matched by his knowledge of geography, and he promptly sent them on a wild goose chase to Muktinath, a pilgrimage site to the north and separated from Annapurna by two great mountain ridges. The most significant of these was the Nilgiri range, a wall of peaks so inaccessible the French christened it the Great Barrier. By May 14th, after a month of exploring, they had written off one mountain as impossible and were still looking for the other one. With the summer monsoon less than a month away, Herzog knew Annapurna would soon be laden with thick cloud and loaded with avalanche risk caused by newly-fallen snow. He held what he called a council of war back at Tukuche, and decided to take a gamble on the Miristi Khola gorge, a deep river valley which flowed alongside Annapurna’s western flanks. It was the last remaining unexplored avenue, and they hoped it would be the one which finally led them to the base of Annapurna. It did. 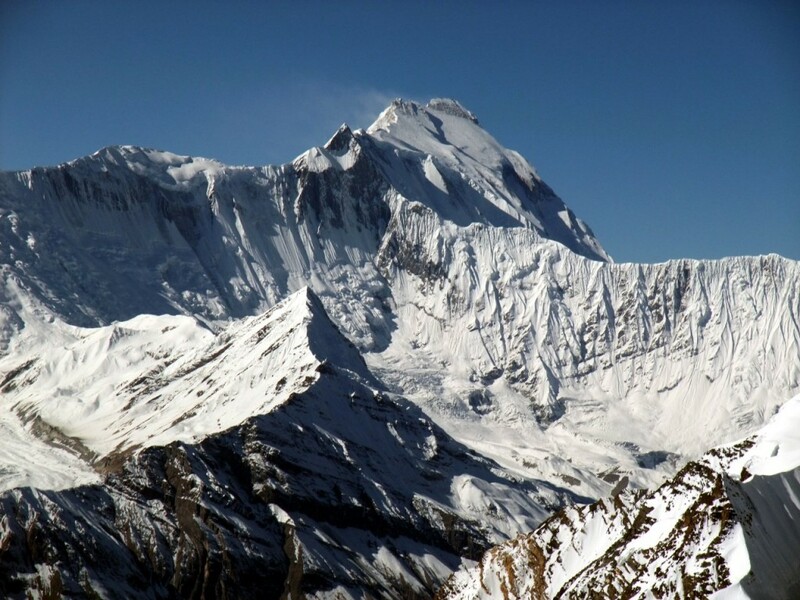 Curling round to the northeast, the Miristi Khola took them to the southern side of the Great Barrier, where they found themselves staring up at Annapurna’s north face. Finally they were in a position to begin climbing. With help from Lachenal and then Herzog, Terray tried to forge a route up the Northwest Spur. Ridges are generally safer and easier to climb than faces, but this one provided a great many technical challenges. An idea of the rock formations they found themselves climbing over can be gauged from the name they gave to the spur: the Cauliflower Ridge. It wasn’t the first geographical feature French explorers have named after food. When, after five days of climbing, the clouds cleared and Terray and Herzog could see the length of the spur all the way to the summit, they realised there were still many difficulties above them and they were running out of time. There was also the possibility of coming across a gap in the ridge that would prove insurmountable. Reluctantly they decided the Cauliflower Ridge was not the way to the summit. Meanwhile Lachenal and Rebuffat had been looking for a route up the North Face, and back at their new base camp, Herzog was greeted by sensational news. Rebuffat had sent a note to say he had seen a way along the right bank of a glacier which he could guarantee would get them up to a plateau beneath Annapurna’s summit, but he couldn’t see what lay above. But Herzog and Terray had seen the plateau from the ridge, and they knew it held no technical challenges. After five weeks of exploring they had found a route to the summit, but there were now only two weeks before the monsoon arrived. Anyone who’s ever worked on a big project will know how a deadline helps to focus the mind, and how much work can be done at the eleventh hour. To put it more bluntly, it’s amazing how quickly you can run with an overflowing bladder when the toilet beckons. Now the goal was in their sights the French team moved like cheetahs. On May 23rd they established Camp 1 at 5100m on the North Annapurna Glacier. The route was menaced by avalanches, and included camps inside crevasses to protect them from icefall. Terray the muscular workhorse led the way with load carrying, and by May 28th they had established Camp 4 at 7150m beneath a curving wall of ice they named The Sickle (in reality it looked more like a cucumber, but they feared the expedition would be open to ridicule if they named every feature on the mountain after a vegetable). By June 2nd Herzog, Lachenal and one of the Sherpas, Angtharkay, were at their high camp at 7400m on the plateau, ready for the summit assault. 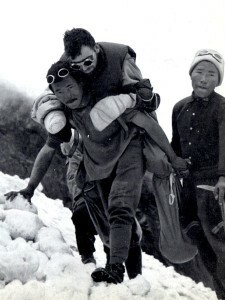 Angtharkay was a legend among the Sherpas. He had been a linchpin in the British Everest expeditions of the 1930s and had accompanied Eric Shipton and Bill Tilman on their exploratory trips in the Himalayas. He is one of my 10 great Sherpa mountaineers. If anyone deserved to be the first man to stand on the summit of an 8000m peak, he was the one, and Herzog knew it. The French team leader gallantly offered his sirdar the chance to accompany them to the top the following day. Angtharkay’s response was immortal, and revealed a wisdom deeper than that of his employer. Thank you very much, Bara Sahib, but my feet are beginning to freeze, and I prefer to go down to Camp 4. Angtharkay had spent the whole of his adult life trekking and climbing, but for him the mountains had always been there. He knew the summit wasn’t worth sacrificing his feet for. Herzog had been given the pill Maxiton by their team doctor to provide him with a bit of a gee up on summit day. This is a stimulant that affects the chemicals in the brain and causes hyperactivity. The sense of euphoria he describes feeling on June 3rd was in strong contrast to Lachenal, a Chamonix guide who made his living leading people up mountains. Lachenal knew how costly a few missing digits would be to his career. Halfway up he realised he couldn’t feel his feet, and if they continued to the summit then he would probably lose toes to frostbite. Herzog was climbing in his own drug-induced haze when Lachenal suddenly grabbed him. “If I go back, what will you do?” he asked. In his book, Herzog described the feelings that went through his mind in vivid terms. In an hour or two, perhaps, a victory would be ours. Must we give up? No, that would be impossible. My whole being revolted against the idea. I had made up my mind irrevocably. Today we were consecrating an ideal, and no sacrifice was too great. It was clear he was suffering from what these days we call summit fever – the excessive desire to reach the summit at all costs with no regard for the consequences of continuing. It was as if the summit was the climax of a mystical experience, rather than a lump of rock covered in snow, albeit an extremely high one. Less charitable people would say he was madder than rabid dog who had swallowed a carton of horseflies. “I should go on by myself,” he said to Lachenal. “Then I’ll follow you,” Lachenal replied. By the time they reached the summit Herzog’s euphoria had still not worn off. What an inconceivable experience it is to attain one’s ideal and, at the very same moment, to fulfil oneself. I was stirred to the depths of my being. Never had I felt happiness like this – so intense and yet so pure. That brown rock, the highest of them all, that ridge of ice – were these the goals of a lifetime? Or were they, rather, the limits of man’s pride? Yes, Maurice, if you say so. Lachenal was feeling a little more pragmatic. “Well, what about going down?” he said. But Herzog wasn’t ready yet. He took the French flag and a camera out of his pack and took photos of Lachenal. Then he handed over the camera and insisted Lachenal take some of him. This was only fair – they would never be back there, and after the weeks of effort it was right for Herzog to preserve a record of their achievement. But when he took the camera back and began loading a colour film, Lachenal snapped. Their retreat was a bit like an episode of the Benny Hill Show, but without the saxophone. Everything that could go wrong did. On the way down Herzog took his gloves off to take something out of his pack. He put them on the ground and watched them slither off the mountain. It didn’t occur to him to retrieve a spare pair of socks from his pack to use as mittens. By the time they reached high camp the weather had become overcast and Lachenal missed the tents. Herzog arrived to discover Terray and Rebuffat inside, resting for their own summit attempt the following day. “We made it. We’re back from Annapurna!” he cried. Terray reached out to shake his hand and realised he was grasping an icicle. At that moment they heard a cry below them. It was Lachenal, who had overrun the camp and fallen into a crevasse. Terray went down to fetch him, but had great difficulty bringing him back to camp. He had to cut through the leather to peel off Lachenal’s frozen boots, and spent the night massaging his frostbitten feet while Rebuffat did likewise to Herzog’s hands in the other tent. The following day they descended to Camp 4 but became lost in a whiteout. Terray and Rebuffat removed their sunglasses to try and see the way, but it was hopeless. Respite came when Lachenal fell in another crevasse. They realised it provided some shelter for an overnight bivouac, and they huddled inside. By the morning Terray and Rebuffat were snowblind. To get to Camp 4 two invalids with frozen feet who could barely walk, one of whose hands had become frozen claws, had to lead two blind men along a trail which had become covered in fresh snow. All that was needed to complete their misery was a hailstorm of biblical proportions followed by a plague of locusts. Luckily the weather was fine, and the monsoon had not yet arrived. One of the team, Marcel Schatz, was waiting near Camp 4 and brought them down safely. Camp by camp Sherpas came up to assist the afflicted. Herzog and two of the Sherpas were caught in an avalanche and swept 150m down the mountain. Miraculously they all survived and were able to continue. The ordeal wasn’t over when they reached base camp. Porters were recruited to carry the two invalids back to civilisation on piggy back. As they returned across Nepal, Herzog and Lachenal were subjected to a series of painful injections by the team doctor Jacques Oudot, in the hope of saving their hands and feet. These were agonising. Both patients screamed aloud for hours as their team mates held them tight and tried to calm them. With their limbs safe from gangrene, Oudot began the amputations. To begin with he trimmed the dead skin away with a pair of scissors, but eventually he began chopping the digits off one by one, culminating in the scene on a station platform in India already described. The amputations took place inside a carriage, with a swarm of locals crowding round, but the nauseating smell soon drove them away. Two of the Sherpas swept the debris from the carriage onto the platform with a makeshift broom made from twigs. In the midst of a whole heap of rubbish rolled an amazing number of toes of all sizes which were then swept onto the platform before the startled eyes of the natives. Herzog ended up losing all his fingers and all his toes, while Lachenal had to be content with just losing his toes. 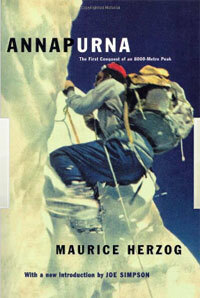 For Herzog reaching the summit of Annapurna was a triumph for the French nation. Despite his terrible injuries he described it as “a treasure on which we should live the rest of our days”. None of his comrades felt as he did. For Lachenal his decision to follow Herzog to the summit had nothing to do with the glory of France. It was just une affaire de cordee, or a matter of rope: the simple act of a guide looking after his climbing partner. It’s possible to look at the 1950 French ascent of Annapurna in one of two ways. Given very few people had ever explored the Kali Gandaki region of Nepal, and for much of the expedition the team were correcting errors on the British Survey of India maps, to return with a successful summit under their belts was an exceptional achievement. It was undoubtedly a very bold and brave climb, involving serious technical difficulties at an altitude few had ever climbed at before. Their speed of progress in establishing camps once a route had been identified was astonishing, and would have been an extreme physical challenge. Their descent from the mountain and retreat across Nepal should not be forgotten either. At one stage a team of four men bivouacked in a crevasse at 7400m during a snowstorm. Two of them were seriously frostbitten and the other two were snow-blind. It’s a miracle that nobody died, and this is thanks not just to the character of the four men themselves, but the outstanding support of the team below them. The 1950 French Annapurna team certainly had determination. It’s probably true to say that all their predecessors to attempt 8000m peaks would not have reached the summit had they been in the same situation as the French. Many of them would not have escaped without fatalities. Taking all of these things into consideration the first ascent of Annapurna was a triumph, and one of the great achievements of mountaineering history. But there’s another way to look at the expedition too: that of a team of bold mountaineers making a series of rash decisions, continually over-stretching themselves, returning with hideous injuries, and being lucky to escape with their lives. Annapurna is considered one of the most deadly of the 8000m peaks, with a disproportionately high death rate to successful summits. It was only due to the recklessness of Herzog they reached the summit, and wiser climbers would not have judged the prize worth the price he paid. Indeed, three wiser climbers were with him on the mountain: Lachenal, who wanted to abort his summit attempt to save his feet, and Terray and Rebuffat, who had no hesitation in calling off theirs to save their companions. But we shouldn’t judge the behaviour of the French team from the comfort of an armchair 60 years later. It’s hard to imagine many people considering a holiday where you end up losing all your fingers and toes a roaring success. 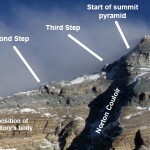 Today there would be few mountaineers who would look upon a climb that resulted in that degree of amputation as anything other than a failure. But these are the standards of our own times, not Herzog’s. Exploration was a more dangerous business in those days; people took greater risks, and sometimes they paid the price. For Lachenal the consequences of Annapurna were great. It was two years before he could climb again, which meant he had no income from guiding. When he did return to the rock and ice, his feet became very painful after a long climb, and according to Terray he never did regain the magic of his climbing before Annapurna. Whether he would have made a full recovery was never known. Ironically his final resting place was also down a crevasse. He fell 45m while skiing in the French Alps in 1955, and was killed instantly. For Herzog the future was very different. His book became a worldwide bestseller and a mountaineering classic. He became Mayor of Chamonix, Mayor of Marseille, and French Minister for Sport. Throughout his life he was a French national hero. He died in 2012 at the age of 93. He never once regretted the loss of his digits. He was acting for the glory of France, and whatever others may have done on 3rd June 1950, as far as he was concerned he made the right decision. Today he would have been evacuated from base camp in a helicopter, and would be in hospital in little over an hour. His fingers may well have been saved. 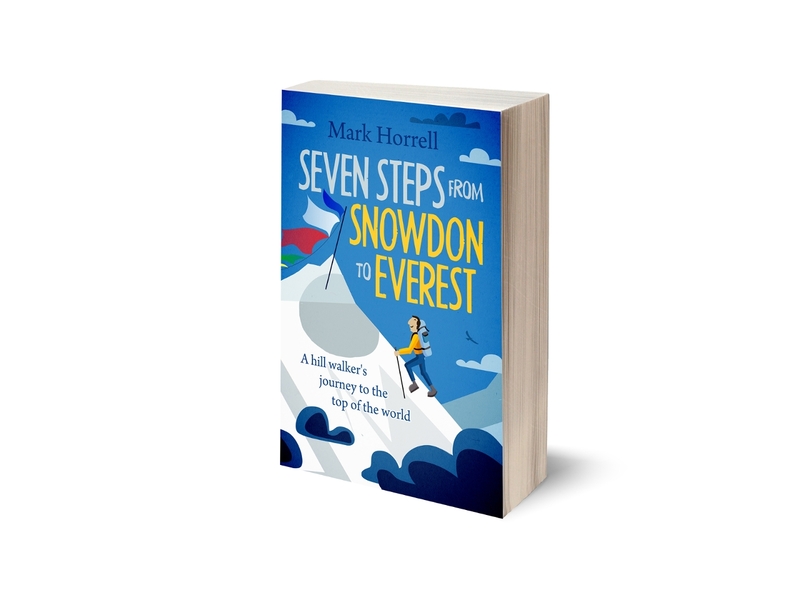 I cover more of the history of the 8000m peaks in my book Seven Steps from Snowdon to Everest, during my own crusade to climb a first 8000m peak. Thanks for the nice summary of their expedition. I read the story as a teenager and it was this book that ignited my passion to climb Everest. I really en joyed the book PATH TO GLORY having been to the Antarctica peninsula, I felt for the explorers, they were wonderful brave men, how could a normal person stand the cold and winds that they did….it was enough experience when you are a touring Antarctic fan !! I love exploration history of all kinds, but take my googgles and mittens off to these brave men in particular. thanks for letting us see these photos on the internet. Erica.